An at times breathtaking, sweeping epic from arguably the finest exponents of the genre. Since leading the charge at the birth of the metal revolution remembered fondly as the NWOBHM, Iron Maiden above all others stand tall as undisputed kings of their realm. With worldwide sales in excess of 100 million units (built mostly with negligible or no media support), they’re unquestionably one of the best selling metal bands in history, but to maintain their position as top dog for the best part of 30 years is one hell of an achievement by anyone’s standards. I was a huge Maiden fan from ‘The Number Of The Beast’ to ‘Seventh Son ...’, couldn’t get enough of ‘em back then, but as the 80’s turned to the 90’s and then first Adrian Smith followed by Bruce Dickinson called it a day, my interest in the band (and I suspect that of a fair few others too) began to wane. Don’t go there on the Blaze Bayley thing - wrong time, and given the choices available to them definitely the wrong guy – but somehow they still managed to emerge out the other side with their integrity intact. Bruce and Adrian have (thankfully) been back in the fold for more than a decade now, and despite what was at best a lukewarm ‘comeback’ with ‘Brave New World’, the band has since got better and better. Their last studio album (2006’s ‘A Matter Of Life And Death’) was nothing short of a masterstroke – loved the way the classic Maiden sound was twisted around in ways not heard this side of Bruce’s solo stuff – so any follow up was certainly gonna have to be something really special if it was to measure up. 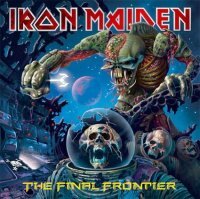 So, after an admittedly long winded introduction, let me introduce you to ‘The Final Frontier’, an album unlike any Iron Maiden album you’ve ever heard in the past. Sure there are plenty of the usual trademarks to be found lurking within its grooves, and despite what you may have heard elsewhere Dickinson can still cut it (albeit with a lot less screaming these days), but there are times when this is so far removed from the norm that you simply won’t believe it until you hear it for yourself. Nowhere is this more marked than on opener ‘Satellite 15’, an extended intro that segues into title track ‘The Final Frontier’. Possibly the darkest place Maiden have ever been, its schizophrenic mixture of conflicting moods and discordant sounds will initially have you checking out the disc to see you’ve picked up something else by mistake! As this gives way to ‘The Final Frontier’ glimpses of the Maiden of old come through at last, albeit clad in a suit of decidedly unfamiliar clothes. No doubt you’ve all heard first single ‘El Dorado’ by now; easily the straightest song on the album and on closer inspection the only obvious single on offer. The first half of the album is wrapped up with three relatively short songs – ‘Mother Of Mercy’, ‘Coming Home’ and ‘The Alchemist’ – all of which twist and turn as the band continue to distort that once familiar formula, but it’s the latter half where things get really interesting from my perspective. A string of five ever more impressive epics (all clocking in over the seven and a half minute mark) kicking off with the mesmerising ‘Isle Of Avalon’, as I said earlier, this is as adventurous, dare I say progressive, as the band has ever gotten. Ebbing and flowing like the tides and with lyrical themes as remarkable as the grandiose musical journey they accompany, the likes of ‘The Talisman’, ‘The Man Who Would Be King’ and ‘When The Wild Wind Blows’ are some of the best songs they’ve come up with in more than twenty years. For those desperate for old Maiden references, the most common hark back to the ‘Powerslave/Somewhere In Time’ era, but really that only tells part of the story. An at times breathtaking, sweeping epic from arguably the finest exponents of the genre, it may take a few spins, but believe me, approach it with an open mind and the rewards are boundless.